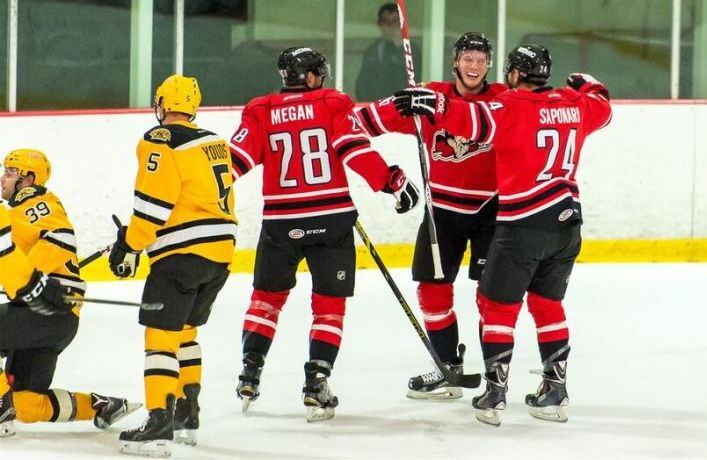 Former Providence Bruin Rob Flick scored a pair of goals against his former squad as the Portland Pirates earned a 4-2 victory over the Bruins Wednesday evening in American Hockey League preseason action at the New England Sports Center in Marlboro, Mass. Rob Schremp, currently with the Pirates on a tryout, added two assists. The Bruins scored less than two minutes into the first period for a quick 1-0 lead as Colton Hargrove slid a rebound past Pirates’ goalie Mike McKenna. Portland, beginning a new four-year affiliation agreement with the Florida Panthers, tied the game, 1-1, at 3:42 on Chase Balisy’s first preseason goal, beating rookie goaltender Zane McIntyre at the 3:42 mark of the first period. At 7:11, Flick tallied his first goal of the night after driving to the net and beating McIntyre. Brad Richard scored on Portland’s only power-play goal with a wrist shot from the top of the right circle with 1:24 remaining in the opening period. Max Iafrate, son of former Washington Capitals’ defenseman Al Iafrate, scored his first goal at 13:24 of the third period to pull the Bruins within a goal, 3-2. Flick restored the Pirates two-goal lead only 32 seconds later to beat Matt Ginn, who replaced McIntyre to start the third period. McKenna made 28 saves in the win. McIntyre stopped 16 of 19 shots in the loss while Ginn made five saves in the third period. Portland went 1-for-1 on the power play while Providence was 0-for-4 with the man advantage. The Pirates will begin the regular season against the Bruins at the Dunkin Donuts Center when they travel to Providence, Rhode Island Sunday, Oct. 11 at 3:05 pm.